Crispy Baked Latkes (Potato Pancakes) are just as crispy as fried latkes. Make Crispy Baked Latkes in advance and reheat in the oven – they’ll be just as crispy as when first baked. 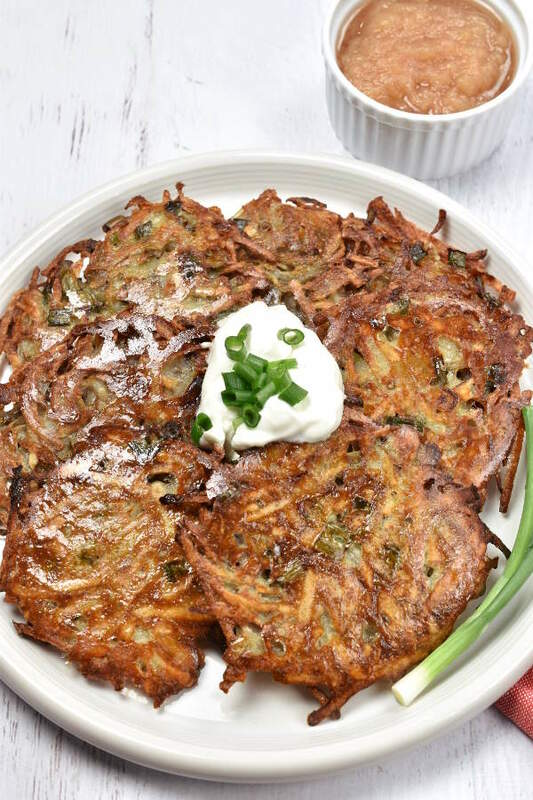 Enjoy this easy latke recipe as an appetizer or side for Chanukah and year-round. Are you seeing those crispy edges? 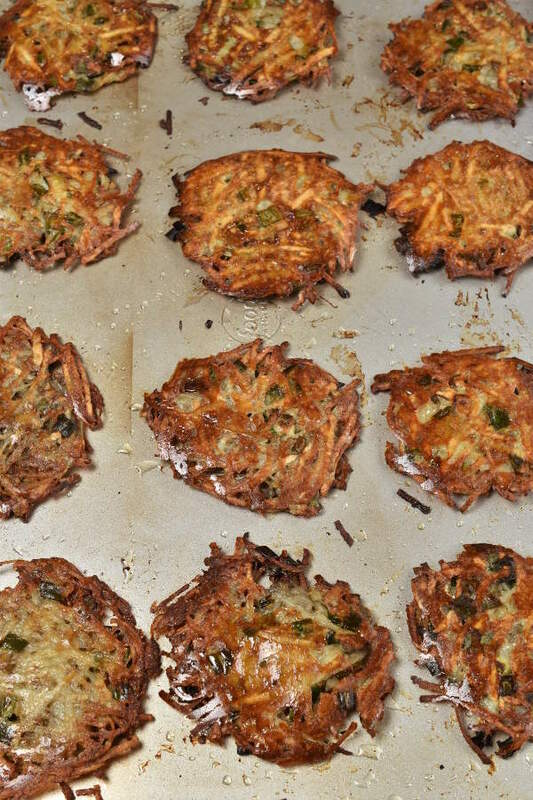 These latkes were BAKED, not fried. 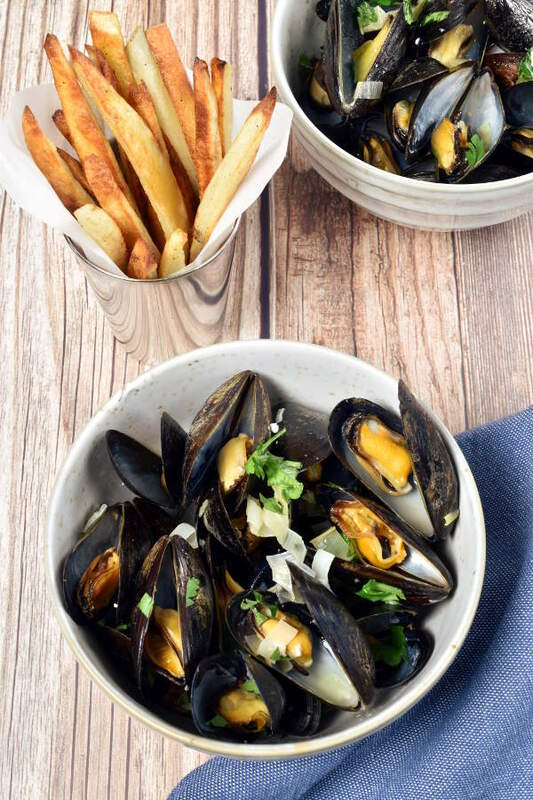 They are so easy to make, and you can make them in advance and reheat without losing any crispiness. After making these, I’ll never fry latkes again. You could spend time standing by the stove, getting burnt with splashes of oil, tediously frying and flipping latkes. Or you could bake them in the oven, go check your e-mail or watch TV while they’re baking, and get the same result! Fried foods are traditional for Chanukah because frying food in oil recalls part of the Chanukah story. When there was only enough oil in in the Holy Temple for the menorah to be lit for one night, the oil lasted for eight nights. Jews eat jelly doughnuts, latkes, and other fried foods on Chanukah to commemorate this miracle. While my recipe is for baked latkes, these latkes still have plenty of oil. Considering the amount of oil actually absorbed when shallow-frying and when baking, I don’t think my latke recipe is healthier than fried latkes. But it’s so much easier, for the same result. The base of my latke recipe is just slightly adapted from a Chanukah children’s book called Malke’s Secret Recipe. The difference is I developed a method for baking rather than frying. 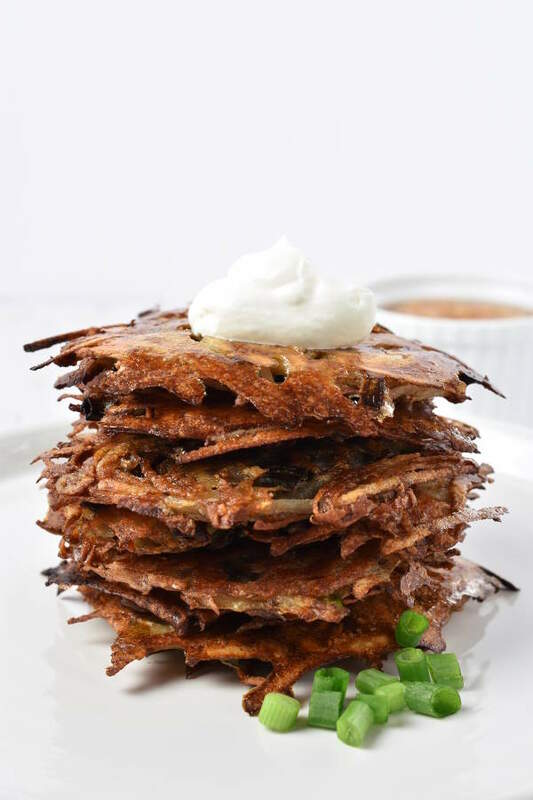 Latkes are traditionally served with sour cream and applesauce. The Instant Pot Applesauce I shared last week is great on latkes! 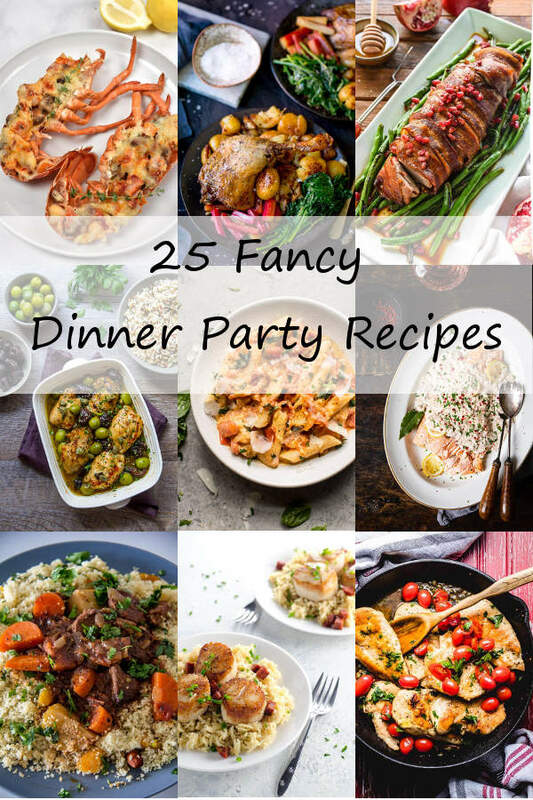 If you want to try something different, you can also serve the latkes with full-fat Greek yogurt or cranberry sauce. 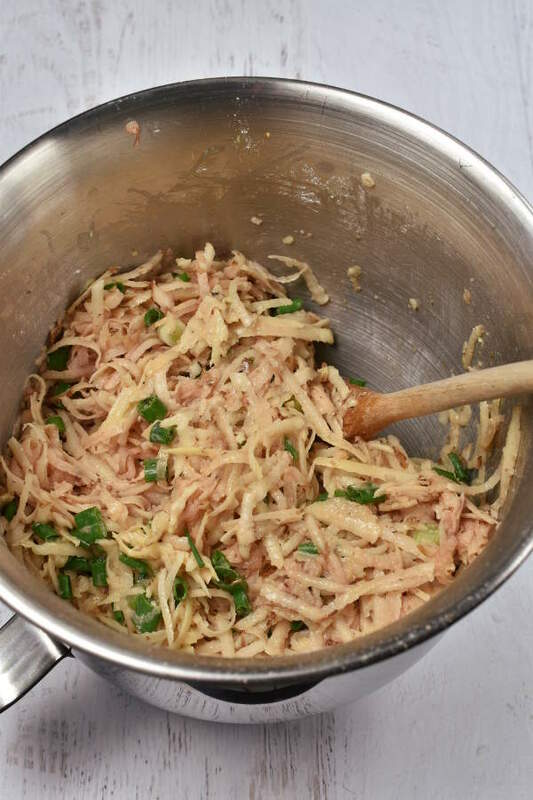 The ingredients are russet potatoes, scallions, flour, eggs, lemon juice, and salt and pepper. I like to chop some extra scallions and set aside to garnish the finished latkes. 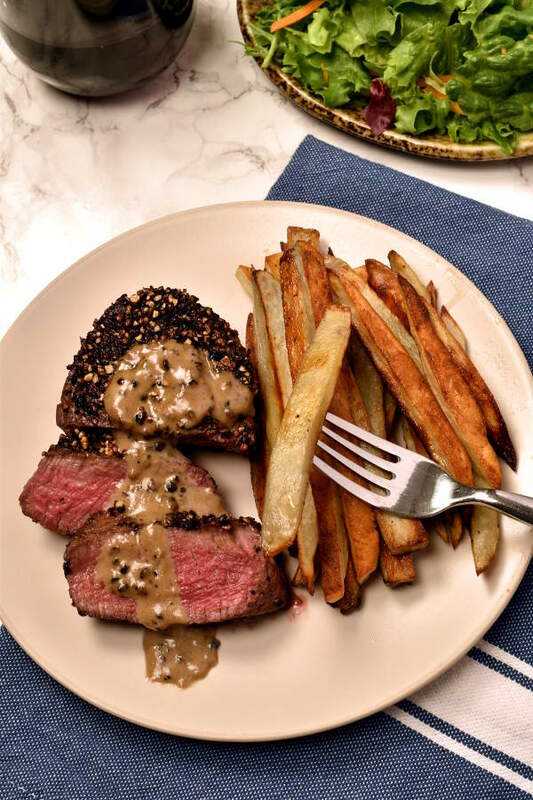 Start out by preparing a sheet pan with oil. Then it’s time to grate the potatoes. Before I owned a KitchenAid mixer, I used to grate my potatoes by hand. I would cut myself every time. Obviously that works if that’s all you have. But if you have any type of food processor, let it do the work for you. I use the coarse shredder attachment on the KitchenAid. Mix in the rest of the ingredients by hand. After you form the latkes, brush the tops with oil. Tuck in the loose potato strands on the edges to prevent them from burning. Flip the latkes halfway through baking, and voila. 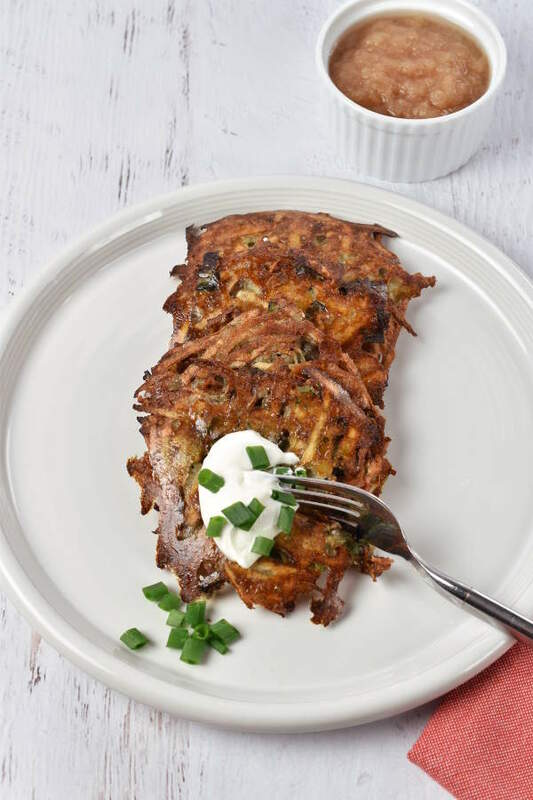 Want to make these latkes in advance and reheat them for your holiday meal? To reheat, lay them out on a baking sheet in a single layer and heat in a 400 degree oven for 10 minutes. Preheat oven to 425 degrees. Prepare at least 2 nonstick baking pans. You will need 2 half-sheet pans (18” x 13”) or 1 (2/3) sheet pan (15” x 21”) and a second smaller pan. Divide 6 tablespoons oil between the 2 pans, based on size, and use a pastry brush to spread oil over the entire surface of each pan. Set aside. 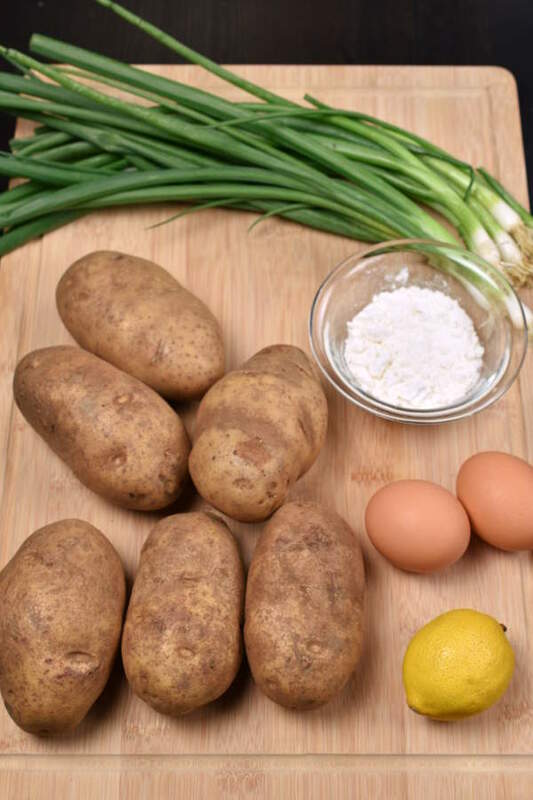 Add scallions, flour, eggs, lemon juice, and salt and pepper to the potatoes. Stir to mix. Scoop about 1/3 cup of potato mixture onto prepared sheet pan and use the back of the measuring cup or a spoon to flatten it out. Try to make latkes about ½ inch thick. (They will be thinner after baking.) Leave enough space between latkes to be able to turn them over with a spatula. Keep going until you’ve used up almost all the potato mixture. The mix at the bottom of the bowl tends to get very wet – just toss that last little bit. Use your hands to tuck in loose potato strands around the edges. 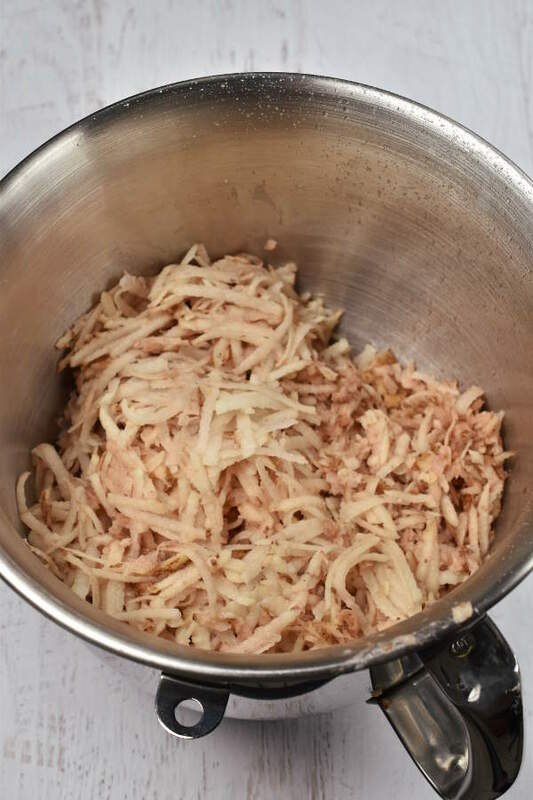 Use a pastry brush to brush the top of latkes generously with remaining 3 tablespoons oil. Bake for 15 minutes. Remove from oven. Use a spatula or tongs to carefully flip over each latke. Bake for 15 more minutes, or until browned. 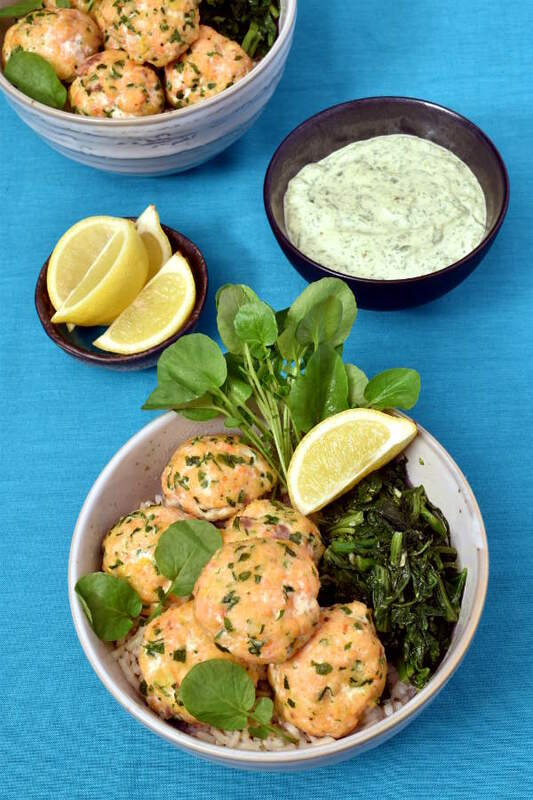 Serve with sour cream and applesauce and garnish with chopped scallions if desired. Make ahead: To reheat, lay latkes out on a baking sheet in a single layer. Heat in a 400 degree oven for 10 minutes. Instant Pot Applesauce recipe available here. 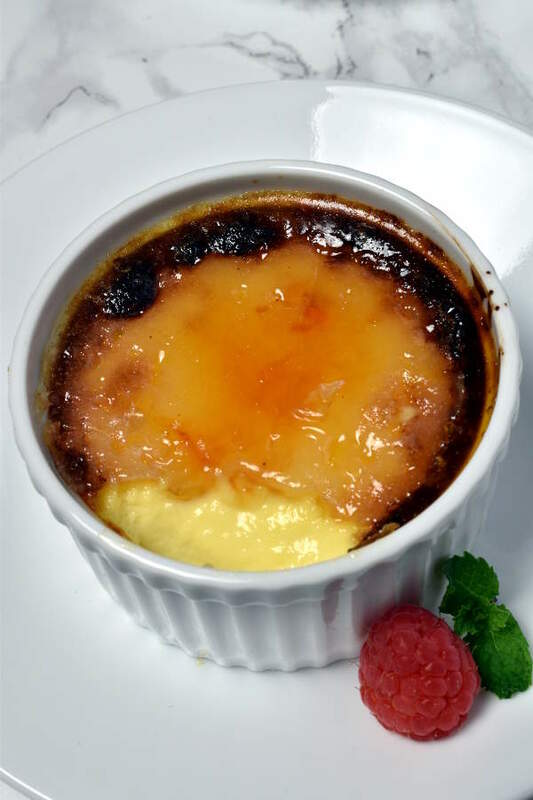 Adapted from Malke’s Secret Recipe. 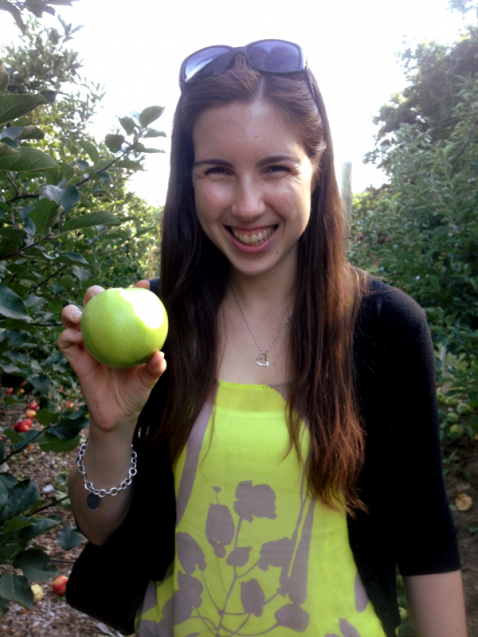 Calories (per latke) do not include sour cream and applesauce.